The Air New Zealand team has always taken pride in the fact that Peter Jackson filmed his 'Hobbit' and 'Lord of the Rings' trilogies in their homeland, but they've taken it one step further for 'The Hobbit: The Desolation of Smaug.' 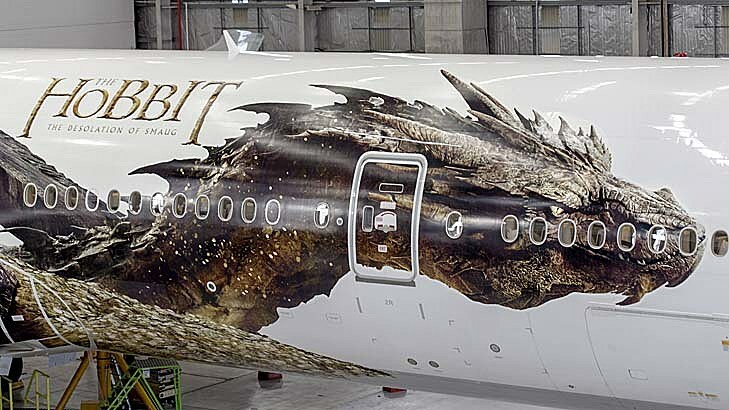 While some of the trailers have refrained from showcasing the evil dragon in his full form, the airline has plastered him all over their new 'Hobbit'-themed plane. 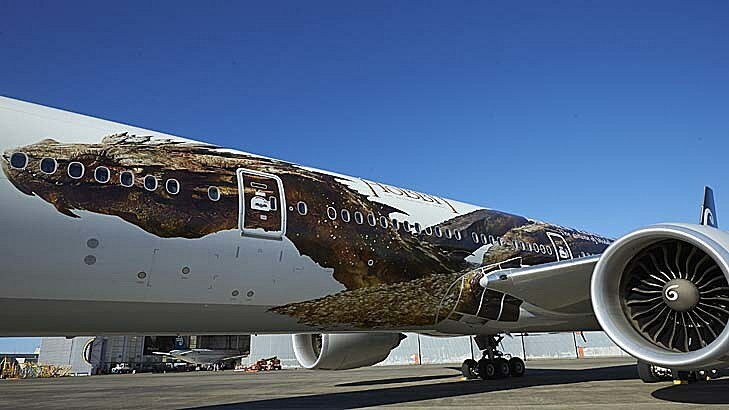 Air New Zealand debuted its new Boeing 777-300 featuring the 54-meter-long dragon on Monday, the plane set to land for the first time in the US at the LAX Flight Plan Museum just in time for the LA premiere of 'The Hobbit: The Desolation of Smaug' Monday evening. Benedict Cumberbatch of 'Star Trek Into Darkness' voices the creature that took the dwarfs' homeland in the film trilogy, though this is the first time we're seeing the creature's full visage -- and he is one fearsome creature. 'The Hobbit: The Desolation of Smaug' features some new faces (Evangeline Lilly, Luke Evans, Lee Pace) and one vet (Orlando Bloom) as the dwarfs, Bilbo (Martin Freeman) and Gandalf (Ian McKellen) continue their journey to defeat the dragon Smaug and reclaim their homeland. Check out the creature in all his glory below. 'The Hobbit: The Desolation of Smaug' debuts in the US on December 13.